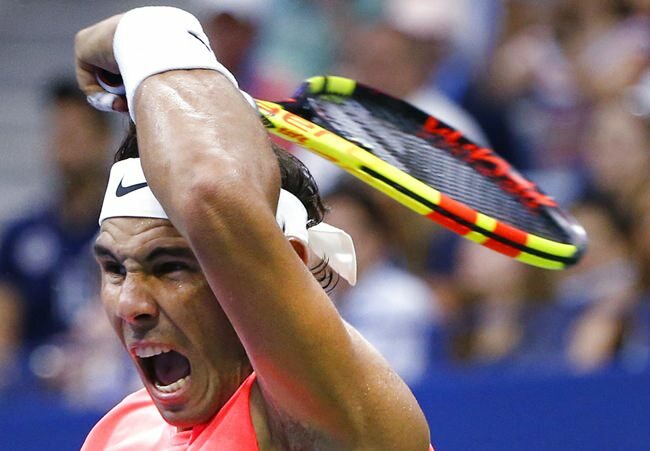 New York (AP) — Rafael Nadal’s knee was bothering him. His decade-younger, barrel-chested U.S. Open foe was bashing the ball. The man he beat in last year’s final at Flushing Meadows, No. 5 Kevin Anderson, got through his own tough test against an up-and-coming opponent, edging No. 28 Denis Shapovalov 3-6, 6-4, 6-4, 4-6, 6-4. Just prior to the delay, Khachanov had served for that set at 5-4, and three times was two points away from taking it. But he couldn’t get closer than that. Nadal broke for 5-all and, after the delay, broke again to even it at a set apiece, aided by two double-faults from Khachanov. When Nadal earned that set with a passing shot that drew an errant volley, he crouched and yelled. Folks sitting in his guest box rose. A chunk of the crowd gave a standing ovation. Khachanov swatted a ball in disgust. The end of the third set was similar: Khachanov twice was two points from owning it and couldn’t get across the line, helping Nadal with three double-faults in the tiebreaker. And while Nadal kept letting set points slip away, four in all, he made No. 5 count, and how. It was a quintessential Nadal point, too: a 40-stroke exchange — yes, 40! — that featured so much defense from Nadal until Khachanov netted a backhand, then tossed his racket on the sideline. He had one more pivotal part to get through: Khachanov’s set point in the fourth while ahead 6-5 as Nadal served at 30-40. But Khachanov put a forehand in the net there, and after a thrilling point that featured a drop shot, a lob, a leaping ‘tweener by Khachanov and a volley winner by Nadal, they headed to another tiebreaker. “That just shows that I’m really close to this high level against top guys. Hopefully it will be soon on my side,” Khachanov said. After they finished, Ashe was the site for Serena Williams vs. Venus Williams, Part 30. It’s their earliest meeting at a Grand Slam tournament in 20 years. Stephens went from up a set and 3-1 in the second to down 4-3 when Azarenka took three games in a row. That’s when rain came.